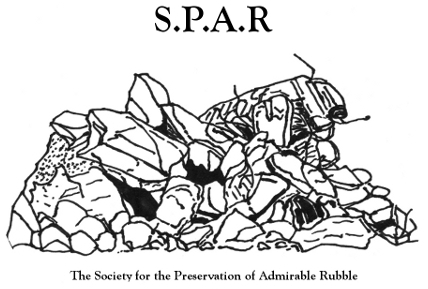 The Society for the Preservation of Admirable Rubble’ (SPAR) is dedicated to preserving the rubble of the UK in all its varied forms. They fight to keep the rubble created from bulldozing peoples home and businesses on display. Not just as a memorial but as an aesthetically pleasing experience. If you have any examples of admirable rubble email to preserveadmirablerubble (@) gmail.com as the Society will gladly except submissions from non-members.